The 3rd Annual Blended Burger Project™ officially launched Memorial Day, with over 340 restaurants in 45 states. This contest invites chefs to create a blended burger and join a movement that strives to make burgers better by blending ground meat with at least 25% chopped mushrooms. Using the blend menu strategy results in an incredibly delicious patty that’s healthier for guests and more sustainable for the planet. In the last two years, more than 700 chefs nationwide—including fast casual, fine dining, food trucks, campus dining and burger bars—took part in the 10-week competition. 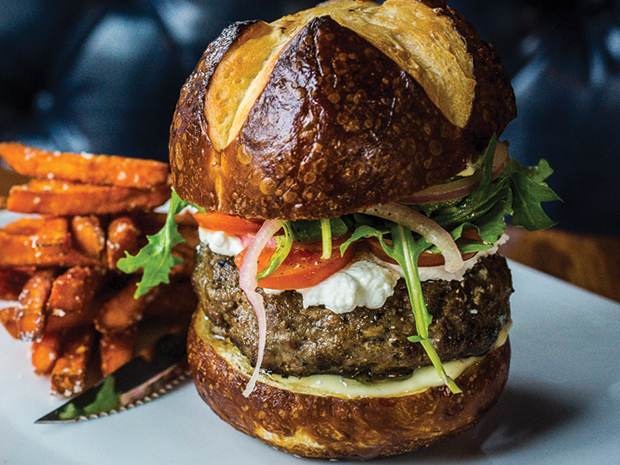 Chefs and restaurants including Hugh Acheson’s Empire State South in Atlanta, Maneet Chauhan’s Chauhan Ale & Masala House, Nashville, and Misha Levin’s Bareburger, across the U.S., menued their take on a blended burger. Participant feedback has been outstanding—93% didn’t find it a challenge to develop and menu the burger, while 90% reported that their guests loved the blend. “Participating in James Beard Foundation’s Blended Burger Project™ isn’t about becoming famous, it’s about inspiring other chefs and proving that dreams do come true,” said chef Adrian Cruz, The Orchard Lounge, one of five 2016 BBP winners. Developing a unique version of the blended burger. Registering to participate with a photo and description of the burger. Menuing the burger and encouraging consumer votes until July 31. New this year, consumers who vote for their favorite blended burger will be entered for a chance to win a trip to the 2018 Blended Burger Project™ event in New York City, where the chefs from the five restaurants with the most votes will be cooking their burgers at the James Beard House. Mushrooms are not only healthy on the plate, they’re also gentle on the planet. A new study suggests blending mushrooms with meat can reduce a chef’s impact on the environment. Water required to grow mushrooms is just a fraction compared to other foods: 1 pound = 1.8 gallons of water. Replacing a portion of meat with mushrooms—the blend—helps keep CO2 emissions and energy footprint in check: 1 pound = 1 kilowatt hour of energy and 0.7 pounds of CO2-equivalent emissions. Mushrooms’ small growing space conserves soil and nets high yields: 1 million pounds = 1 acre of land required. The mushroom industry is the largest recycler of agriculture waste in the food landscape. The sustainability benefits of the blend make the Blended Burger Project™ an integral part of the James Beard Foundation’s Impact Programs. The contest runs until July 31, 2017. Visit jamesbeard.org/blendedburgerproject to register today and to read the contest’s Official Rules, including eligibility requirements, voting and judging criteria.